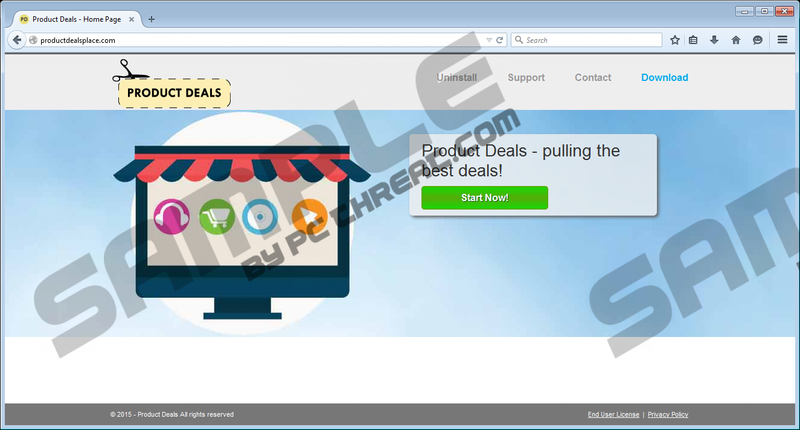 Product Deals is one more creation of the infamous SuperWeb LLC. This company is also responsible for Insider Deals, Shop Time, Hard Case, Screen Boost, and a bunch of other ad-supported programs that must be deleted from the infected operating systems. Does this mean that you also need to remove Product Deals? It sure does, and our malware researchers urge computer users to delete this ad-supported program ASAP. Are you familiar with productdealsplace.com? It is unlikely that you are, because this site is not used for the distribution of Product Deals. Instead, this adware is spread by unpredictable third-party installers that can attach the installer of this ad-supported program to browser hijackers, third-party tracking cookies, potentially unwanted programs, and malicious files. Do you think that this kind of software requires removal? If this is what you think, you are right! Users must delete Product Deals-related malware. Has Product Deals started to showcase ads, pop-ups, coupons, and other kinds of offers already? You might find some of them quite attractive, but this is not an indication that they are reliable. In fact, the attractive ads are the reason you must remove Product Deals. According to our virtual security experts, even the most unreliable parties could use the data collected by tracking cookies to determine the kind of ads you are more likely to interact with. Needless to say, this trick could be used to fool you into interacting with malicious ads. If you don’t delete Product Deals, the unreliable ads will keep appearing again and again. Unreliable advertisements could be associated with the advertisement-supported programs that come bundled with Product Deals. If you are not sure, the best thing to do is install a malware scanner that will help you distinguish the malicious programs from the harmless ones. If you install a malware scanner from this page, you will also have a chance to upgrade it to a full-feature automatic malware remover. We strongly advise using this tool to delete Product Deals-related programs because manual removal might be too difficult. It is difficult to say if you will be able to remove Product Deals-related malware manually, because we cannot predict which programs could be installed with this adware. Nonetheless, we can discuss the manual removal of Product Deals itself. In most cases, you should delete this program just like any other unwanted program. After you complete the guide below, you should run a malware scanner, and, if leftovers are detected, you need to make sure that the removal is completed. Tap Win+R to launch RUN, enter Control Panel, and click OK.
Find the app you wish to delete, right-click it, and select Uninstall. Click the Windows logo on the Taskbar to access the Start menu. Go to Change or Remove Programs, select Product Deals, and click Remove. Quick & tested solution for Product Deals removal.